I would like to know how could I reduce the 'lumpy' surface of the Co coating (METCO 45NS)? I had read through the articles posted in this forum that discussed about the fine-powder-cluster oxide, actions had been done to reduce the cluster oxide, however the coating finishing was still not good enough, and it appeared in different surface finishing. 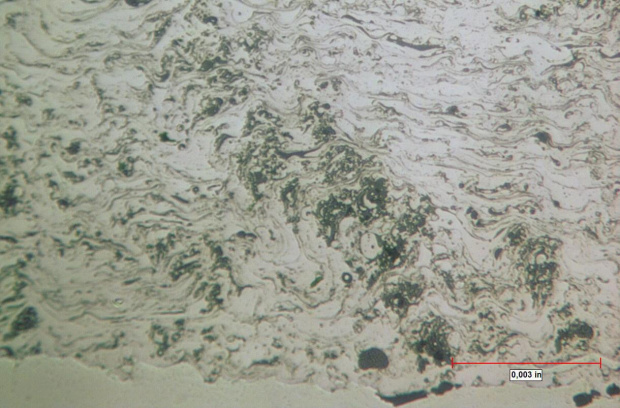 Top area is good with smooth and fine surface, microstructure shows no or very little cluster oxide. However about 10mm from the edge, the coating become very rough and lumpy, microstructures are terrible with very bad cluster oxide. The coating is sprayed with Pristine condition, with test coupon fixture. Sulzer 3MB gun is used. I wish to know if this caused by the spraying parameters or spraying method? Is the gun square (at 90 degrees) with the test-piece? The coating deteriorates down the test piece as if the spray stream has turbulence entrapment or is bouncing off something? Maybe the test-piece fixture, holder or clamp is causing problems? Are you using SM 45C-NS or SM 45VF-NS (or)? If C-NS then consider the VF-NS or a duplex of both if the application requires a thicker deposit. I take it that you are using the standard Sulzer Metco parameters? Are you rotating the test-piece and traversing across it OR step scanning a static test-piece? The fact that you have an 'acceptable' coating at the top means that something is causing an increasingly poorer deposit towards the bottom. I think that set-up or method is the factor here. A few reasons i could think of..
1. Turbulence in powder flow during spray like Len suggested. 2. Variation in spray distance while spraying. Really need to know more detail on your process set-up as suggested by Len and K09. Quote: Is the gun square (at 90 degrees) with the test-piece? The coating deteriorates down the test piece as if the spray stream has turbulence entrapment or is bouncing off something? Maybe the test-piece fixture, holder or clamp is causing problems? Details of test piece set-up, speeds and feeds, relative direction of spray pass to test piece. relative position of powder port and cross-jets, parameter set and material used, coating thickness, substrate preparation (roughness)? Does test piece spraying reflect same conditions of actual job? Are the same problems evident on actual part? (assuming you have got that far). Quote: The fact that you have an 'acceptable' coating at the top means that something is causing an increasingly poorer deposit towards the bottom. I think that set-up or method is the factor here. I did suspect that powder turbulance was caused by the 'stream-flame cut' due to the fixture design. Hence I tried to use the bigger test piece (double in width, same length), but it gave poor finishing. 'Lumps' were 'propagating' from the edge all to way to the center. Quote: Are you using SM 45C-NS or SM 45VF-NS (or)? If C-NS then consider the VF-NS or a duplex of both if the application requires a thicker deposit. I take it that you are using the standard Sulzer Metco parameters? In fact using Praxair powder, Co-103 which equivalent to SM45-VF. Parameters not exactly same as SM but very close, except lower Argon (55slpm). Too high Argon will have too much unmelted particles. And it caused more cluster oxide propagating from it. Quote: Are you rotating the test-piece and traversing across it OR step scanning a static test-piece? Yes. It is rotating part with 75m/min surface speed? Earlier stage, I tried to lower the surface speed to 40m/min, but it didn't help much. No sure if I were in correct developing direction. So did you ask your suppliers? No...Do think suppliers (SM) would answer me if not using their powder... hee hee...That's why asking for help over here... .. No contact to Praxair.. I have noticed that this subject is quite old but maybe someone can assist me with coating problem - Praxair CO-103. We are coming across of some kind of banding, systematically on whole microsection of the coating. How would You define this and is the cause of such indications - please see attached photo. Seems to be a common problem with these types of coating. From a metallography stand point often referred to as "oxide clusters" and not always a problem that's easily overcome. Thank You for assist and for giving me precise links to talk about this problem. I would like to visit your forum often and hopefully I will find some good solutions and maybe will have chance to share some experience. Any recommendation for the solution?